I am a widely travelled man, and everywhere I visit around the world, there is agreement that Nigeria has the potential to make that leap from third world to first that Singapore, under Lee Kuan Yew, made. We have the human and material resources required to make the leap and in fact, many of our nationals have helped other nations make that transition. One, we have promoted, tolerated and indeed celebrated a defective political structure. The federalism we practice is not smart. We politicised the creation of states and local governments over the years. States and local governments became too weak to meet their constitutional responsibilities and consequently the Federal Government emasculated them and took away those responsibilities which belong to them. Many of the states are small, subsistence economies with very limited capacity to sustain growth and lift their citizens out of poverty. It is therefore very attractive for these states and local governments to become addicted to revenues from federation accounts and to care less about their internal revenue opportunities. As a result, combined Internally Generated Revenue from all the 36 states came up to less than 1% of Nigeria’s nominal GDP and less than 12% of their 2016 budgets! Internally generated revenue is far less than what the states require to run their administrations – and many state and local governments survive by consuming more resources than they can generate internally – thanks to the generous ‘handouts’ from the federation accounts. Two, we allowed crude oil to ‘crowd out’ the non-oil sectors which were Nigeria’s lifeline in the 1960s and 1970s and celebrated the windfall from oil exports – which resulted in a steep rise in the volume of funds allocated to all tiers of government in the federation. We preferred to survive on rent than on hard, productive efforts. We were too drunk to remember to build a revenue buffer – for the proverbial ‘rainy day’. There has been no effective revenue stabilization programme and effective strategic planning to cushion the effect of falls in the price of crude oil. Three, we lived on another structural fault line for too long and pretended all was well. The Nigerian economy remains fragile and vulnerable to the vagaries of the global oil market, making the fiscal position of the national and sub-national economies become precarious. However, this faulty economic structure has always been shielded by increased revenues from crude oil sales. Its deficiency is only exposed when global oil prices collapse with impact on investments, consumption and growth. First, there is no alternative to a policy which promotes the growth and diversification of the sub national economies. How much revenue they generate locally from taxes and fees depends on the size and structure of their economies. The bigger and more diversified the better. The federal government will create a business-friendly macro-economic environment, through the pursuit of appropriate monetary and exchange rate policies, to leverage private sector investments especially in agriculture to promote economic diversification. Indeed, achieving diversification is central to our economic development strategy. Let us begin to visualize Nigeria without oil or one not predominantly dependent on hydro-carbon. Second, our economic policies will be coherent, consistent and therefore more predictable by the business community. Nothing could be more threatening to investment flows than an environment that is full of policy flip-flops. Third, we will ensure spatially balanced investments, through a carefully designed incentive regime, in order to provide more opportunities in the poorer and less endowed federating units. Fourth, the sub-national economies will be assisted in reforming their economic management institutions, including the revenue generating agencies which are seen by many as failed and ineffectually managed institutions within the state service. They need to be reformed and strengthened to make them more innovative and efficient in service delivery. The reformed agencies will be expected to improve tax-payer compliance, develop potentials of non-tax revenue sources and block all leakages associated with tax administration. Fifth, beyond institutional and administrative reforms to improve operational efficiency of the revenue agencies the federating units will be challenged to double their efforts in rebuilding the fiscal-social contract, by enhancing service delivery in key areas such as health, education, water supply and infrastructural development. Only this would change the predominant perception that government revenues are diverted to the private bank accounts of politicians and their cronies. Sixth, And it is for the purpose of making states lose their addiction to federal allocation, to make them look inwards, and return to the healthy competition of 1957-1966, when Nigeria practiced her unique brand of true federalism known as regionalism, that I suggest the introduction of matching grants to states, that have succeeded in increasing their internally generated revenue. Seventh, in furtherance of strengthening their economic management systems, another policy I would recommend to Nigerian state is to follow the example President Obasanjo and I laid between 1999 and 2007 when we privatized and liberalized many aspects of the Nigeria economy. It had the almost immediate effects of reducing our wage bill and increasing services, capacity and jobs in the private sector. By privatising those state government owned public enterprises that gulp huge sums by way of recurrent expenditure yet give little returns by way of return on investment, state governments can free more of their revenue from recurrent and devote it to capital expenditure. Eighth, we will promote and insist on fiscal efficiency at the federal level to lead other tiers of government by example. The states will be challenged to adopt sound fiscal management strategy so as to reduce wasteful spending. Many view government spending as wasteful, imprudent and lacking in priorities. Typically, recurrent costs constitute between 60% and 72% of state and local governments. In her just released book, “Fighting Corruption is Dangerous –The Story Behind the Headlines”, Dr. Mrs. NgoziOkonjo-Iweala, former Managing Director of the World Bank and two time Nigerian minister of finance and coordinator of the economy who served during my time in office, revealed that she almost got beaten up by a particular Governor at a meeting of the National Economic Council, because she would not approve his request to take out more foreign loans for his already over indebted states. Ninth, it is also imperative that our foreign reserves and revenue buffers are boosted to insulate the economy against adverse shocks and to strengthen countercyclical fiscal capacity. Unless these stabilisation vehicles are reshaped Nigeria will continue to be subject to the vagaries of the world oil market. Let me use this opportunity to once again emphasise why everyone of us must be involved in the discourse on re-structuring. When I carry the gospel of restructuring Nigeria around, I don’t carry it for mere political convenience, I am in this crusade for the purpose of making Nigeria work. Africa and indeed the world needs a Nigeria that is working. These are some of the ways I believe Nigeria’s states can improve their capacity, increase their revenues and better manage their local economies which are critical to the safety, prosperity, and welfare of all Nigerians and will allow my homeland to realise its true potential. 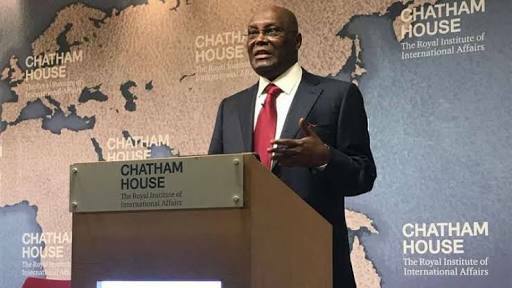 Atiku Abubakar was vice president of Nigeria between 1999 and 2007.